It finally hit, the big wave we’d been waiting for! The 11th began inauspiciously enough, with rain falling early in the morning, which prevented us from opening the nets. Those of you familiar with migratory fallouts may think the rain was a good sign, but the wind had been out of the northeast quadrant throughout the entire night of the 10th/11th, so we weren’t anticipating a push. Despite everything though, the warblers finally arrived. Maybe the drive to breed was getting too strong to wait any longer for the wind conditions to improve. On census that morning, about one hundred metres into the Fish Point trail I had already counted 13 warbler species. Magnolia, Cape May, Blackburnian, and Bay-breasted Warblers, and American Redstarts were all new for the season. 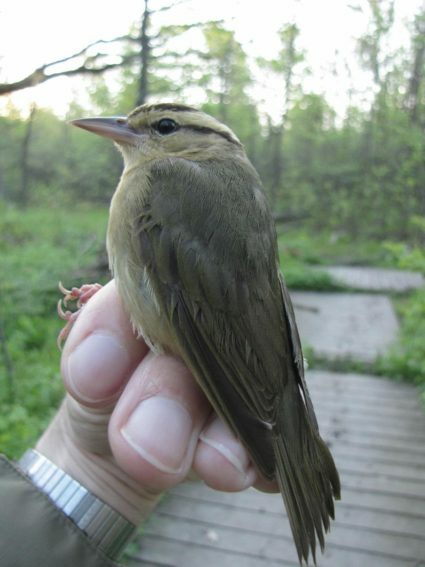 There was also a Cerulean Warbler reported at Fish Point that morning, though it wasn’t recorded by any PIBO staff. We got the nets open at nine o’clock, and over the next three hours we caught 139 birds. That included 117 individuals of 19 warbler species. Nashville Warblers were by far the most abundant at 45 birds banded, followed by Chestnut-sided and Magnolia Warblers at 14 birds apiece. Two male Golden-winged Warblers were the most notable catch, and both were older males with very crisp, fresh plumage. We continued to catch a high volume of birds for the next several days, though not as high the 11th. We had 48, 57, 75, and 47 captures on the 12th, 13th, 15th, and 16th, of May, respectively. Two thirds of these were wood warblers. Nashville Warblers were still the most numerous on the first two of these days, then Tennessee Warblers took over the top spot. Strong west winds on the 14th kept the nets closed, and also transformed Fish Point’s west beach, pushing in many stones and temporarily eliminating the sand bar islet off the tip. This last meant a lot more gulls and cormorants sitting on the tip itself. Two more American White Pelicans were also seen sitting on the tip on May 20th. These were different individuals from those observed in the last summary period as they were still in their completely white winter plumage. No black wings. Our most unusual bird this summary period was a Worm-eating Warbler. It’s a ground nester whose known breeding range covers south-eastern Ohio and most of Pennsylvania, but doesn’t make it across the lake. The picture above is an interesting exercise in foreshortening. You may notice that the Worm-eating has a rather large bill for a wood warbler, this has to do with its diet consisting principally of caterpillars (formerly termed “worms”) rather than smaller adult insects. Another source of excitement was the arrival of the first Prothonotary Warbler of the season. A male was seen and heard in the net area on the 16th, but thus far there is no sign of any birds around the Prothonotary nest boxes up towards Mosquito Point. It’s beginning to look like the bird we saw was a passage migrant, and the absence of any other activity makes it doubtful the island will have any breeding pairs this season. The Birds of North America reports that nest initiation begins mid-May for northern breeding populations of the Prothonotary, with the first egg date being recorded no later than May 18th in Michigan. The fact that we have yet to even observe a male on territory suggests that they won’t be coming back this year. We’ll just have to make do without our clerks. A good-size group of Pine Siskins was an unseasonal sighting above the nets on May 17th. These guys should be up north breeding by this late in the spring. In the last few days we’ve been recording fairly high species diversity, but we’re back to having no more than one or two individuals of each species appear. The further leafing out of the trees, combined with a sustained period of clear, sunny weather, has meant that a lot of birds are keeping to the canopy, and our capture rate has slackened since the 16th.